Exploring is part of human nature. We are, in varying degrees, curious creatures. That curiosity lead us out of the trees and spread mankind over the world. That curiosity took us from bashing things with stones through to making tools, everything went downhill after that. 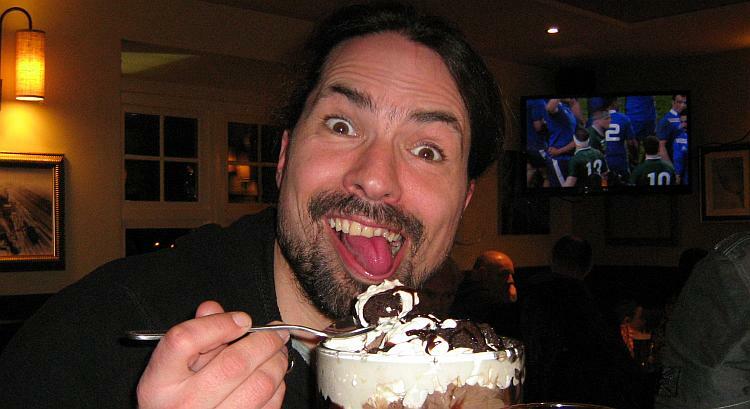 After the invention of the spoon there was no hope for mankind. We are curious about different things. I like to learn about science stuff and what is inside an engine. I also have a weird thing about wanting to know where that lane goes. I believe curiosity should be encouraged though there may be a few government agencies who'd disagree. While exploration is natural it seems to work better with a motive, a reason. I know a chap who is rather obsessed with battlefields and such from both world wars. This has provided justification or an excuse to go to Gallipoli and Norway and countless delightful places between. I watched a talk the other weekend and this chap has started to explore the Scythian Empire. If you Google Scythian Empire you'll see he's given himself a vast area to cover. 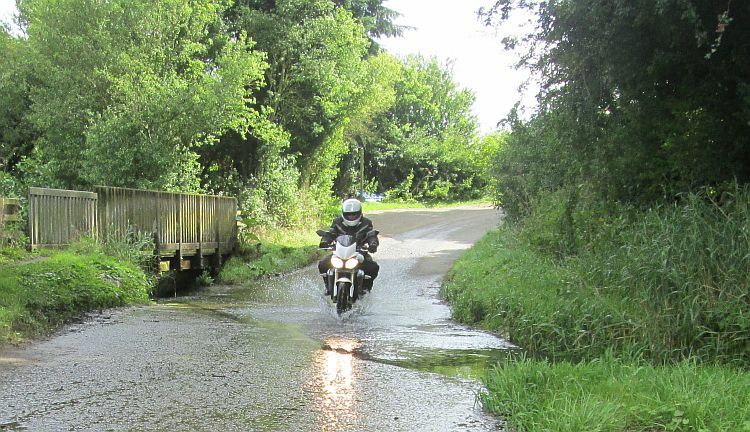 When I was first introduced to the idea of "adventure motorcycling" I got into wetroads.co.uk OK, so all the fords listed are UK based so perhaps I was rather limiting my range but it proved to be an excellent place to start. Just keeping to my local area I found a plethora of secluded, beautiful and fascinating places but a handful of miles from roads I know all too well. Fording - a damn fine excuse to go for a ride. While I used to like a nice ford I wasn't obsessed with them, I was enjoying finding them and finding new places. The fords were a reason or an excuse to get out there and discover new places. I guess I'm not very good at wandering totally aimlessly, having a destination gives me focus. With over 2,000 fords listed on WetRoads I've barely scratched the surface of all the potential places this site could lead me to. I still get a little excited when I stumble across a random ford and I will look it up as soon as I get online. I still also drop into the site from time to time to seek inspiration for another ride. While I still have this soft spot for a ford I think I'm looking for a fresh excuse. I want something that will take me into Europe (if we're allowed after Brexit). I don't want to go to cities. I don't want to pay a fortune to "get in" to whatever it may be. I prefer quieter places if possible. I have toyed with the idea of steep roads rather than wet roads. These would typically be out of town (but not always). I don't think I'd normally have to pay for them. Being steep they'd be a challenge to ride. Regular readers will know I like a good mountain range and there'll be steep roads there. Steep roads do tick a few of my boxes. Of course nothing is perfect. There are beautiful places in flat areas too. 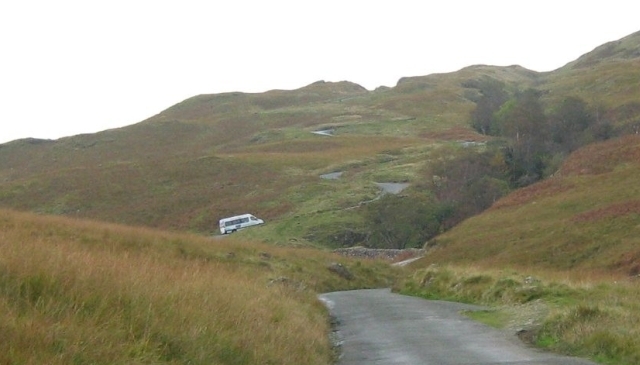 Having once ridden the Hardknott Pass I'm not too sure how Sharon would feel accompanying me on some of the roads. Is there a list of steep roads, if not how would I go about finding them? Hardknott. Perhaps the only surfaced road that truly scared me. I like history too. Castles and ancient monuments? Yeah I like these things but then so do many other people which means they're often busy. It's quite common there are exorbitant entrance fees too. I am open to suggestions but please don't be offended if I dismiss them. What is right and good for you might not provide the kind of excuse that I'm looking for personally. I'd be interested to hear your excuses and your reasoning behind them. I'd also be interested if you are the sort of person that can just set out and wander for no reason at all. Do I need an excuse to do this? Hi Ren, how about riding the roads across military ranges? One of my favourite drives is Otterburn - fantastic scenery, challenging roads and the added bonus of being ambushed by squaddies practicing! Just don't go when the flags are flying. There must be many others around Britain. Can't wait to try it on the CBF125. It does however require a membership. The only downside as the national trust are pretty useless with their members money. Stone circles make an interesting diversion there are many in shape and size all over the country. Usually in remote places... Well worth hugging a few druid stones..
As it happens we were in Barnard Castle last week on a family trip and I took the opportunity to go across the highest through road in England - the one going over Harthope Moor between Teesdale and Weardale - in the Disco of course. There's an even higher one a little further west over Coldberry End but I'm not sure that it's still open to motorised vehicles. The roads between Weardale and Teesdale make an interesting zigzag route which I did do on a bike - the Honda Dominator I had as a commuter in the early 21st century. The lead museum at Killhope is an interesting place. You may also feel inclined to attend classic bike events - the Beamish Trial was a recent one and that's based around the same area. They are a good excuse to go somewhere different and see elderly machines and riders in action. Have a look at the VMCC pages. I note no-one took up my suggestion to enter the National Rally which will definitely take you to paths less trodden. Aaaahh the National Trust. Back in't day the bike club I were in would do a few bike rallies. On the Saturday afternoon rather than sitting in a grubby field getting drunk we'd ride out and oft times end up at a National Trust place of some description. I recall the tour guide at Bolton Abbey being well informed, entertaining and humorous. He really brought the place to life. It's a consideration but not without issues. Walking around country houses wearing bike kit and boots and carrying a helmet and dripping on their pristine floors is sometimes frowned upon. There's the cost too. Oh - and it is UK based - Europe? Jim - have I said something to upset you? Trying to get me killed in a training exercise isn't very nice. Actually I've been across the tank range in Salisbury. There's a range of some description next to St Govan's Chapel we visited in South Wales. We've been as close as you can get on road to Cape Wrath. If I recall we walked through some kind of range near Perranporth in Cornwall too. There might be some mileage in that idea Jim. I like the idea of highest roads Ian. They'll certainly take us to some mountain ranges by default. That list is a good start too - I'm surprised at how many of them are in The Pennines as I never thought of The Pennines as being all that tall. I shall do a little more research for highest roads. Two pre requisites for me are weather and food. I've ridden for donkey's years in ice encrusted clothing and you know what, it stinks! So good weather and a good place to eat. Or good weather and find a good place to eat. Obviously being bikers that also means a good place to park our pride and joy. I'm not thinking of biker friendly pubs, cafes etc, but regular places that embrace the odd rogue motorcyclist and pillion. It sometimes nice not to be among a hoard of greasy bikers. It may of course be a separate thread or something you wouldn't necessarily agree with on the site but I'll start with two good day ride caffs for me which could obviously be used by others on longer rides. 1. The Haven Cafe, Leith, Edinburgh. Great food and service, close to The Royal Yatch Britannia, Edinburgh city centre and great roads like the A68 and A7. Not far from the new crossing. 2. The Drift Cafe, Cresswell, Northumberland, all types of food, lovely people and right on the Dunes with good access via the coast roads to Amble, Alnmouth, Alnwick etc. Ian looks a nice trip across France. I really must have a trip to Europe on my bike or maybe Scotland. Hopefully I can gate crash one of ren's and Sharon's trip next year. Upt'North - admittedly most of the cafes I go to are "biker" cafes. Not specifically set up for motorcyclists but the motorcyclists regularly gather there. I daresay the age of the cafe culture is still with us in some way. However yes I also enjoy going somewhere "non biker". So far from countless cafes, pubs and restaurants over the years I've only ever found one that wouldn't deal with a rider the same as any other customer. I often wonder if some riders WANT to be rejected so they can cause a stir. I'm not so keen on the cafe in Edinburgh city, I'd end up terribly lost. The one on the Northumbria coast looks good though. I've put a star on my Google maps. Bridges looks fun Ian, and not too hard to find. I've seen the Millau bridge from underneath but when I looked up my eyes were filled with rain, the weather was awful that day. I've also been over the Pont Du Normandy. I could list a whole plethora of brilliant bridges but there's space for many more. 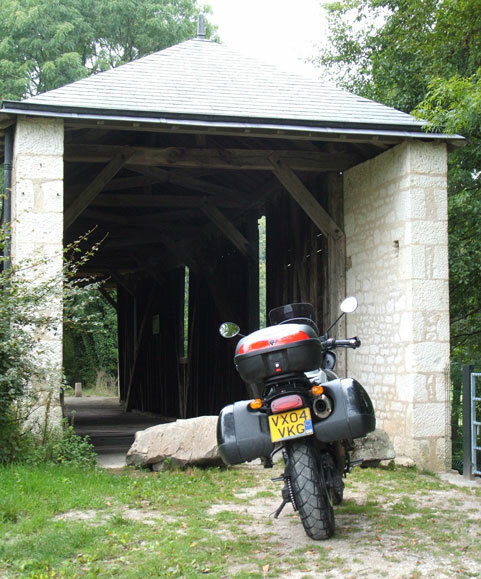 I do rather like the covered bridge, very evocative and I can't recall ever seeing one in the flesh. Pocketpete. I'm looking at "doing" a week in Scotland but this time on the Southern West Coast. I've never been to Campbeltown see. I'll let you know how I get on. Ren the Ed, if you're doing SW Scotland then hope you like these pics, The Isle of Bute and The secret coast are to die for. We did a 4 day mini tour about two years ago. Its charm is in no bugger goes there and so much easier to get too than the Highlands which are full to bursting these days. Just like my school report. Must try harder! I wouldn't go as far as to say The Highlands are full to bursting but yes it's busier up there than it used to be. 2 nights Ayrshire coast, 2 nights Campbeltown area, 2 nights Strontium and 1 night Peebles to break up the return journey. This isn't set in stone, just something I'm toying with so far. Oh and the pictures, both of them, look gorgeous. Grrrrr, wanna be there. Ren the Ed, if spending time in Ayrshire consider going onto Bute at Wemyss and off again on the north of the island to the Secret Coast and onto Campbeltown. Either stay on overnight or just a lunch stop perhaps. 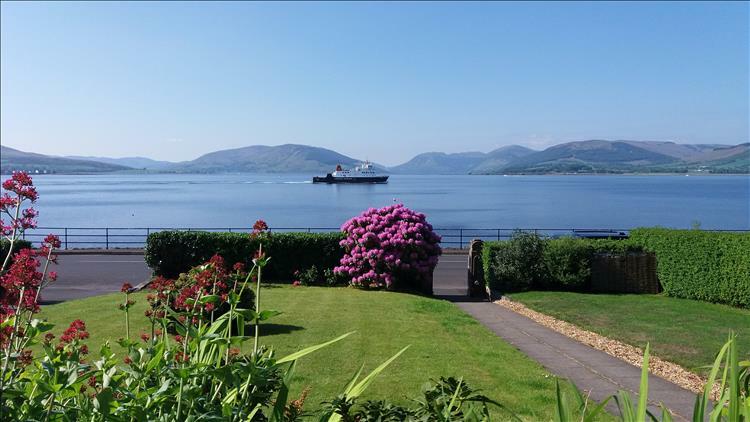 The Isle of Bute is, well, a beaut. A ride around the island doesn't take long and there's good places for food. Enjoy your planning. I love the planning! I also know a good overnight in Girvan, but if you're camping then that's of no use. Lowland. Campbelltown looks interesting. Probably less traffic as well. Might actually buy a tent in the January sales..
Upt'North. 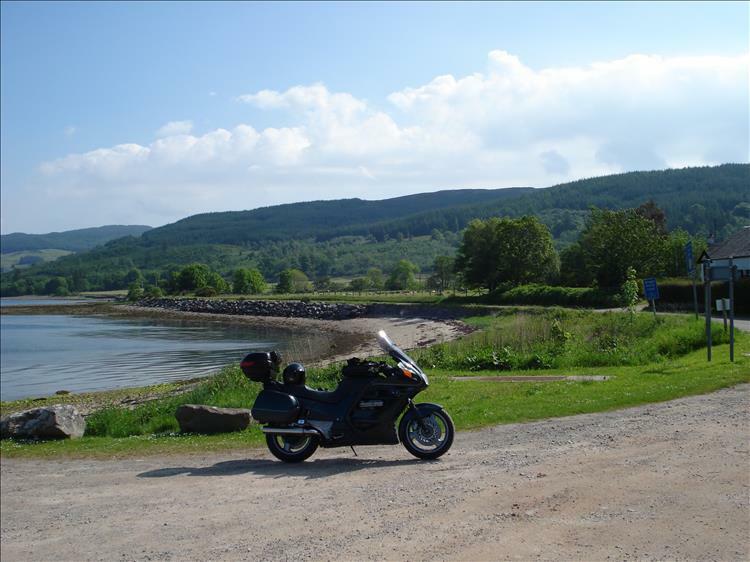 There's a campsite close to Rothesay on Bute. I think that might be a good place to stop. Pocketpete - I am hoping the long skinny peninsula will mean it's quiet. I've been as far as Tarbert a long time ago. It's all still up in the air but I am starting to like the idea so it's slowly becoming a certainty. Hmmmmm.